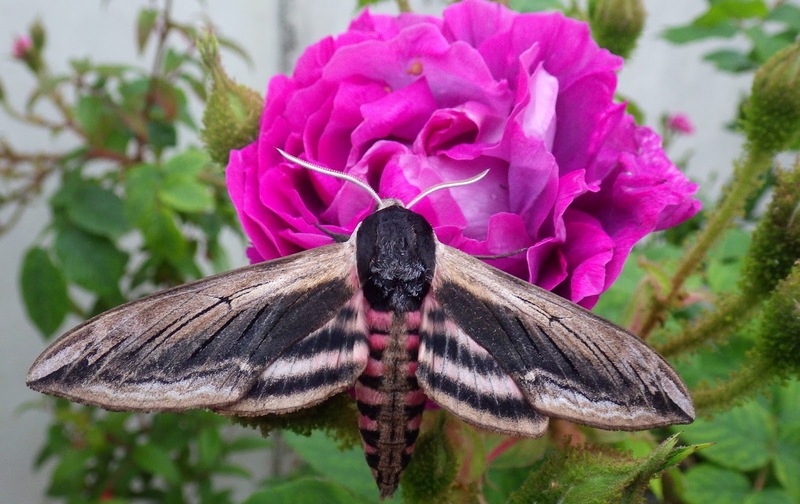 Carmarthenshire Moth and Butterfly Group: I just could n`t resist! I just could n`t resist! Because of a rather poor night last night (<25 species) at my home trap site (just the MV this time) and the forecasted heavy rain later this evening (28/5), I was not going to trap. But I`ve succumbed to temptation and put my MV out again. Tonight, I have not put the MV on the more visible flat-roof site, as puddling of rainwater there both spoils and drowns numerous moths, so it is simply placed on the garden path. In spite of the promised heavy rain it is predicted to be quite windless and warm overnight. 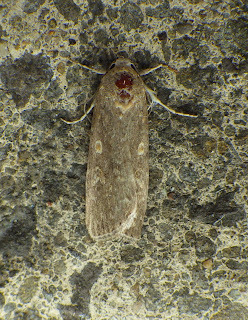 Secondly, my reading earlier of some of Jon Baker`s interesting write-ups in the Carms Moth Group Newsletters that were produced by him in the mid 2000s has inspired me to trap. We`ll see what the morning will bring. Hopefully, `Pwll Passport Control` will intercept a migrant or two...well, perhaps! Above: the trap positioned with an extra large rain-guard on top in readiness for any deluge. 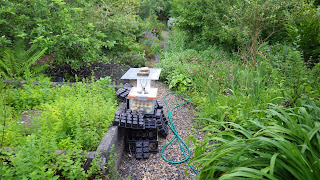 Note that I`ve used plastic seed modules rather than egg trays due to the effect of rain on the latter. Above: privet hawk-moth showing its dimensions against the garden rose `William Lobb`. Magnificent Privet HM, Ian. I've only ever had two here, the last in 2013 so I'm due one! I only put a small actinic out last night because like you I expected rain, but it didn't materialize. Nothing of particular interest in the trap this morning but I caught the first Case-bearing CM of the year in the house yesterday. Jane trapped at Rhandirmwyn last night, with good numbers and some nice records - but she also had the heavy rain! Perhaps it was `hit and miss`. 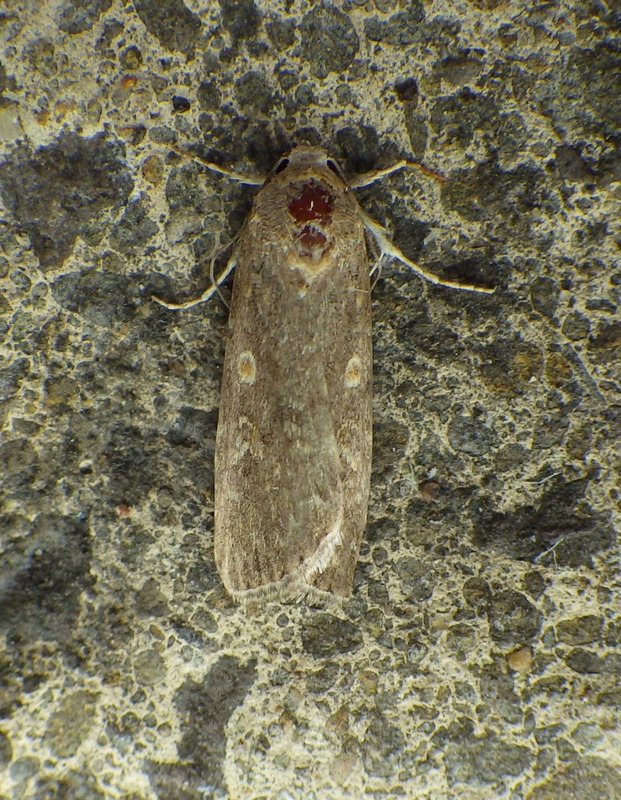 Don`t mention those case-bearing clothes moths - they`re out with me too! Snap in Cardiff - the rain failed to turn up, and oddly I had a much better catch than on any of those hot nights last week (admittedly last night was cloudier, and still very warm). Just a couple of diamondbacks on the migrant front. Shoulder-striped Wainscot new for the garden.